This past June, at the Vatican Library, while examining three fifteenth-century manuscripts containing copies of a musical treatise by the composer and music theorist Ugolino of Orvieto (ca. 1390-1452), I discovered an erased name on an otherwise blank page. Just as I was about to return one of the tomes to the Vatican Library’s custodians, my eyes caught what at first appeared to be a mere smudge, then, after much squinting and tracing, a barely visible letter or two, but after several attempts to reconstruct these letters it remained complete nonsense. Only after plucking up the courage to request from the librarians the ultraviolet light apparatus, did I learn that it was indeed text, in fact the name of another music theorist from the early fifteenth century, appearing upside down: "prosdocimo de bel domando padoano." This erased name is found in a manuscript copy of Ugolino’s Declaratio that has long fascinated me, and not only because it is a gloriously illuminated manuscript: Vatican City, Biblioteca Apostolica Vaticana, Ms Rossiano 455 (I-Rvat Ross. 455). 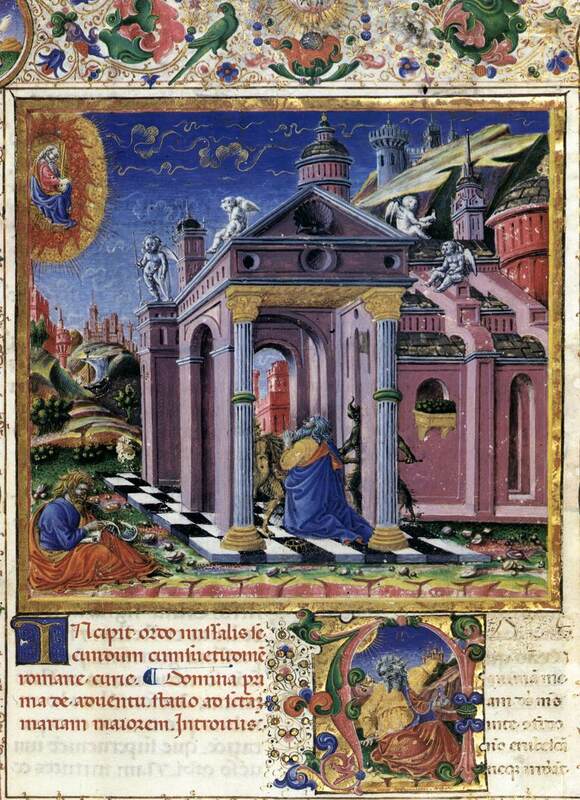 It is a nearly complete copy of the treatise that was bound and illuminated before October 1453 in Ferrara, and has absolutely no surviving ascription to Ugolino in it. The erasure appears on the back (i.e., verso) of a blank flyleaf that opens the volume, preceding the stunning frontispiece illuminated by the Ferrarese artist Giorgio d'Alemagna. 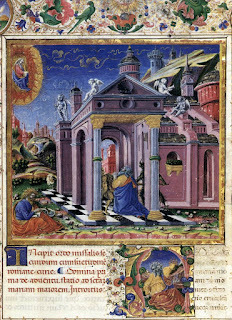 Image 1: Vatican City, Biblioteca Apostolica Vaticana, Ms Rossiano 455, fol. 1r; B/W facs. reproduction in Hans Tietze, Die illuminierten Handschriften der Rossiana in Wien-Lainz (Leipzig, 1911), 127-130, plate V. Color facs. reproduction in Toniolo, La miniatura a Ferrara, 141-145. The erased ascription is now facing this frontispiece. Ugolino’s treatise on music, Declaratio musicae disciplinae (ca. 1430), is remarkable as an exhaustive treatment of all musical knowledge (scientia) in one systematic and encyclopedic text in Latin. 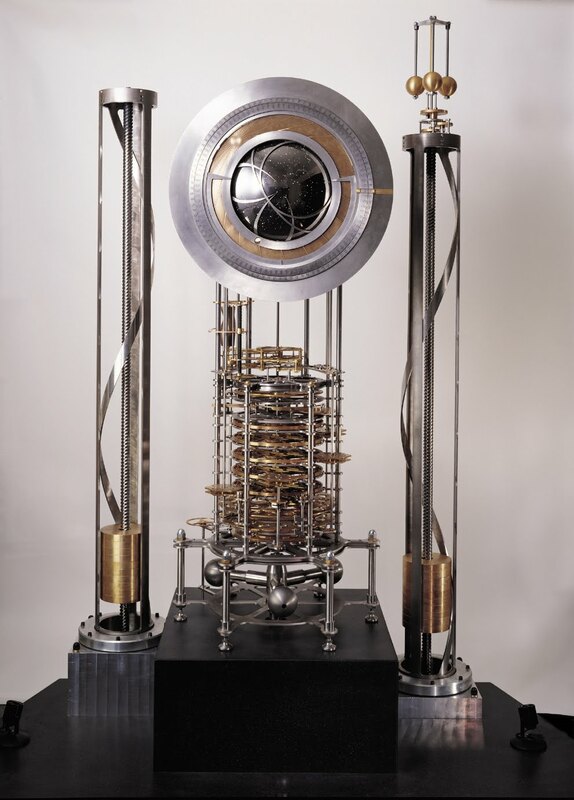 Covering topics that include singing, instrumental performance, composing melodies and rhythms, the sense of hearing, the harmony of the spheres, mathematical ratios of intervals, and more, the treatise was well-known for its balanced handling of speculative and practical matters, as well as its integration of ancient and more recent musical writings. A contemporary scholar even praised Ugolino’s treatise for its ability to “eclipse the labors of all who have written before him.” This landmark tome circulated for decades in handwritten copies among leading music theorists, including John Hothby (ca. 1430-1487), Franchino Gaffurio (1451-1522), and Bartolomé Ramos de Pareja (ca. 1440-after 1491), some of whom quoted passages in later debates concerning musical notation, counterpoint, and tuning systems. In a recent article, I drew attention to this lasting readership of Ugolino’s Declaratio, and to the occasional confusion that the treatise was instead authored by the theorist, mathematician, and physician Prosdocimo de’ Beldemandi (d. 1428), the very theorist whose erased name I discovered in the Vatican Library’s Rossi 455 manuscript this past summer. Based at nearby Padua, Prosdocimo authored several treatises on music, astronomy, and mathematics. Like Ugolino, he completed a commentary on the late medieval Libellus cantus mensurabilis as well as a treatise about how to divide the monochord. Examples of this confusion over attributing the Declaratio include the early sixteenth-century music theorist Giovanni del Lago (ca. 1490 - 1544), who quoted from the Declaratio frequently in his letters to fellow theorist Giovanni Spataro and others, although he believed the passages to come from treatises by Prosdocimo. Using textual evidence, Bonnie Blackburn, Edward Lowinsky, and Clement Miller have claimed that Del Lago was most likely copying passages of the Declaratio from the Rossi 455 manuscript, while penning his letters. In light of Giovanni del Lago’s early sixteenth-century confusion that Prosdocimo wrote the Declaratio, what is exciting to me is the possibility that at one point this illuminated copy of the Declaratio might have been ascribed to Prosdocimo. With none of the surviving sources of the treatise up to now offering such an ascription to Prosdocimo, or even hinting at one (nor to anyone else besides Ugolino), this erasure is an intriguing lead. While the several topics of musical theory that were treated with great detail by both Prosdocimo and Ugolino make such a muddling of authorship understandable, I remain acutely curious to better know the intellectual relationship of the two theorists. Together with the proposal by Blackburn et al. that I-Rvat Ross. 455 was Del Lago’s source of Ugolino’s theoretical writings, this small discovery contained on a blank page may now assure us that what might have appeared to be a foolish error or slapdash guesswork by an early reader of Ugolino’s treatise like Del Lago was in fact an act of seemingly accurate citation. 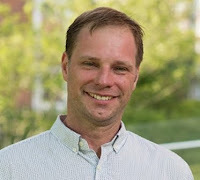 Evan A. MacCarthy is Assistant Professor of Music History at West Virginia University. He is presently preparing a new critical edition and first-ever translation of Ugolino’s Declaratio Musicae Disciplinae for Brepols Press. He is also completing a monograph on the study of music by Italian humanists in the fifteenth century. 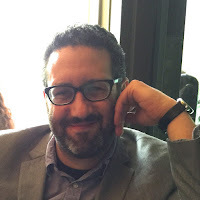 His essays have recently appeared in The Cambridge History of Fifteenth-Century Music (Cambridge and New York, 2015), Qui musicam in se habet: Studies in Honor of Alejandro Planchart (Münster, 2015), Renaissance Then and Now (Pisa, 2014), Beyond 50 Years of Ars Nova Studies at Certaldo, 1959-2009 (Lucca, 2014), the Journal of the Alamire Foundation (2013), and elsewhere. Thanks to generous support in the form of a grant from the West Virginia Humanities Council and a West Virginia University Faculty Senate Grant for Research and Scholarship. The erasure can be read on the verso of the flyleaf, which is ruled but otherwise blank, below the very last ruled line, near the bottom of the page, and upside down. The arrangement of this folio’s ruling also appears to be flipped, when compared with the ruling on every other folio in the manuscript, suggesting to me that this folio was removed, then rebound upside down and backwards, perhaps to hide the erasure of the incorrect ascription. The folio is not numbered among the other fascicles of the MS, but the quality of the parchment and the ruling indicate that it must be an original folio to the volume. One possibility is that it might have been some kind of "top sheet" and the name was erased and inserted at the time of binding as a flyleaf to protect the illuminated first folio. While art historians have identified this manuscript’s illuminators (Giorgio d’Alemagna and Guglielmo Giraldi), I have elsewhere argued for more specific dates of illumination and binding (October 1453, in Ferrara), using archival payment records from the Este court in Ferrara (which are now in the Archivio di Stato in Modena), and that one of its two scribes is the same scribe as that of the important mid-fifteenth-century polyphonic songbook, Porto, Biblioteca Múnicipal Publica, Ms. 714 (P-Pm 714), as well as two other theoretical manuscripts. On the identification of the illuminators, see Giordana Mariani Canova, Guglielmo Giraldi: miniature estense (Modena, 1995), 51-56; Federica Toniolo, La miniatura a Ferrara: dal tempo di Cosmè Tura all’eredità di Ercole de’ Roberti (Modena, 1998), 141-145; Cesarino Ruini, “Produzione e commitenza dei trattati di teoria musicale nell’Italia del Quattrocento,” in Quellen und Studien zur Musiktheorie der Mittelalters III, ed. M. Bernhard (Munich, 2001), 341-357, at 350-2; Camilla Cavicchi, “Strumenti musicali a Ferrara nel Rinascimento. Prassi, collezionismo, sperimentazione,” (Tesi di laurea, Alma Mater Studiorum-Università di Bologna, 2001), 68-73. On my proposed new dating, see Evan A. MacCarthy, “Music and Learning in Early Renaissance Ferrara, c. 1430-1470,” (Ph.D. diss., Harvard University, 2010), 98-126; MacCarthy, “The Sources and Early Readers of Ugolino of Orvieto’s Declaratio Musice Discipline,” in Beyond 50 Years of Ars Nova Studies at Certaldo, 1959-2009 (L’Ars Nova Italiana del Trecento, vol. VIII), ed. Marco Gozzi, Agostino Ziino, and Francesco Zimei (Lucca: Libreria Musicale Italiana, 2014), 401-425, at 419-422. Ugolino, Declaratio musicae disciplinae, ed. Albert Seay (Rome: American Institute of Musicology, 1959-62), 2: 60-61. Biondo Flavio, Italia Illustrata, IV.34. MacCarthy, “The Sources and Early Readers,” 410-411. For a recent appraisal of Prosdocimo’s theoretical writings, see the introduction to Jan Herlinger’s edition of Plana musica and Musica speculativa (Urbana, 2008). Bonnie J. Blackburn, Edward E. Lowinsky, and Clement A. Miller, eds., A Correspondence of Renaissance Musicians (Oxford, 1991), 152-5. What sort of seasonal music was on your mind there at the Monasterio? “Casta diva”—you know, mistletoe and all that. My friend Pius took the title role. I found it all rather mind-bending. After having given His Holiness a small proof of my skill on the armonium and on my work-a-day pianino, he addressed a few very significant words to me in the most gracious manner possible, admonishing me to strive after heavenly things in things earthly, and by means of my harmonies that reverberated and then passed away to prepare myself for those harmonies that would reverberate everlastingly. Good advice. Meanwhile, see below for some film of how it was before I got religion. 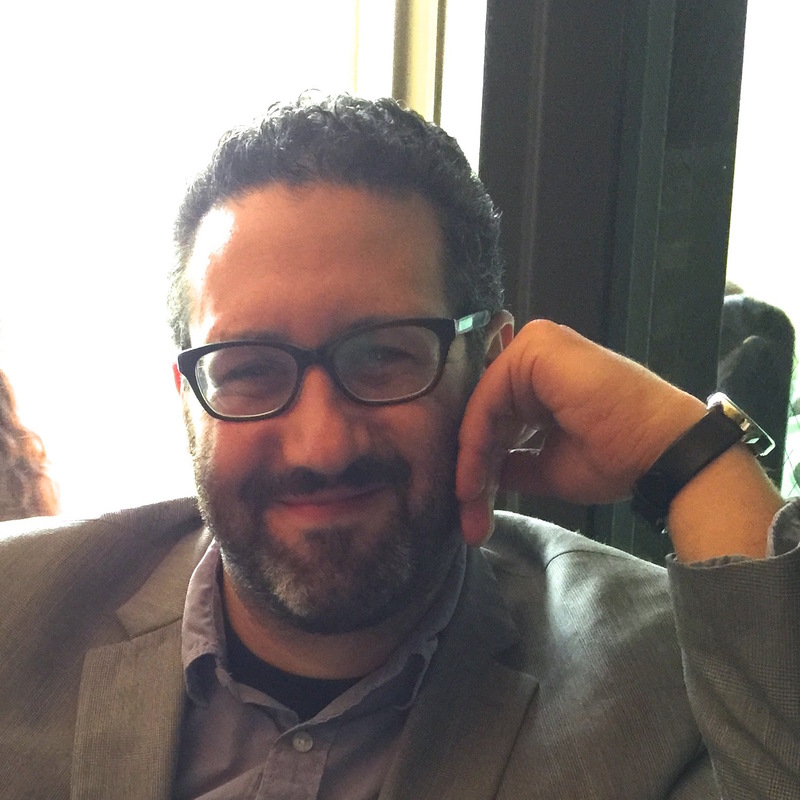 Here is the second of two video interviews prepared during the American Musicological Society's national meeting in Louisville in November 2015. Don M. Randel talks with Carol A. Hess and Elisabeth Le Guin about their new books on Hispanic subject matter. All three were honored at the meeting: Randel, as Honorary Member; Hess, with the 2015 Robert Stevenson Award for her book, Representing the Good Neighbor: Music, Difference, and the Pan American Dream (Oxford UP); and Le Guin, with the 2015 Otto Kinkeldey Award for her book, The Tonadilla in Performance: Lyric Comedy in Enlightenment Spain (Univ. of California Press). Carol A. Hess is Professor of Music at the University of California, Davis; website HERE. Elisabeth Le Guin is Professor of Music and Director of Graduate Studies at UCLA; website HERE. Don M. Randel is past president of teh University of Chicago and the Mellon Foundation; Wikipedia article HERE. There is a small but distinct possibility that my Example 5.7 is the stupidest thing ever recorded in a studio. It lasts about 5 seconds and comprises the four-measure midpoint of the motet Hélas/Corde mesto by Guillaume de Machaut (download it here). A full recording of the motet exists, but Example 5.7 is not an excerpt from that. No, mezzo-soprano Clare MacNamara, viellist Michael Rigsby and I actually sang these four measures, and only them, abruptly stopping when our music ran out, and smiling at each other at the end of the take. It was absurd, and we knew it. The back-story is that the book whose argument this tiny sound-byte purports to forward is about fourteenth-century motets (and monsters, too, though that isn’t pertinent here). Medieval motets are musico-poetic objects deeply connected to the cultures that produced them, and those of us who write about them do our best to target a multidisciplinary audience: my hope is that my musicological and music-theoretical colleagues as well as those in medieval studies, literature, and history might find something to like in these dense, polytextual songs, as might graduate and undergraduate students in some of these fields. So I do my best to make motets accessible to the widest range of audiences. Colleagues who have presented music-analytical arguments at interdisciplinary conferences know what sometimes happens when a music example turns up in a paper: half of the audience shuts down. (I’m not talking about you, you hidden musicians with decades of experience on the violin or piano, though you happen now to study Augustine. I’m glad you are in the world, and I hope you enjoy my music examples.) And even some musicological colleagues get antsy when they see my examples—chimeras that preserve fourteenth-century note-shapes but use modern clefs and staff alignment (see Example 5.7, below). So when a colleague who studies medieval French chansons de geste asked whether my book’s music examples would be recorded, I said “sure!” and thought “why not?” There are singers in the world, and vielles, and the AMS kindly gave me a subvention to pay the performers and engineer. And now some 38 recordings accompany The Monstrous New Art on its companion website. Four of them render whole motets, others give significant sections of music including first glimpses of motets which have not previously been recorded. They are not all, in other words, as ridiculous as Example 5.7. Example 5.7: Machaut, Hélas/Corde mesto (M12), mm. 79–83. Reprinted from Zayaruznaya, The Monstrous New Art: Divided Forms in the Late Medieval Motet (Cambridge University Press, 2015), 190. “And anyway,” I thought hopefully, “maybe no-one will listen to the short ones.” After all, my argument does not require that the reader hear these four measures—it only asks that she believe my prose about them. Hélas/Corde mesto is an unusual piece in that its motetus (usually a middle voice in Machaut’s motet) spends the first half of the piece as the highest voice. During Example 5.7 it finally descends to its natural place, while describing the bad people (“malis,” m. 80) whom the goddess Fortune elevates and the good ones (“bonis,” mm. 82–3) whom she unfairly casts down. So the movement of voices in pitch-space is mapped onto the movement of people in the metaphorical vertical space of Fortne’s wheel. Graphical apparatus in the printed example helps communicate this—the dotted line at the midpoint, the gray arrows indicating the motetus’s unusual place above the triplum. If I attempt to make my point in three different ways, it’s because of a cynicism (pragmaticism?) I have about whether anyone ever looks at my music examples. 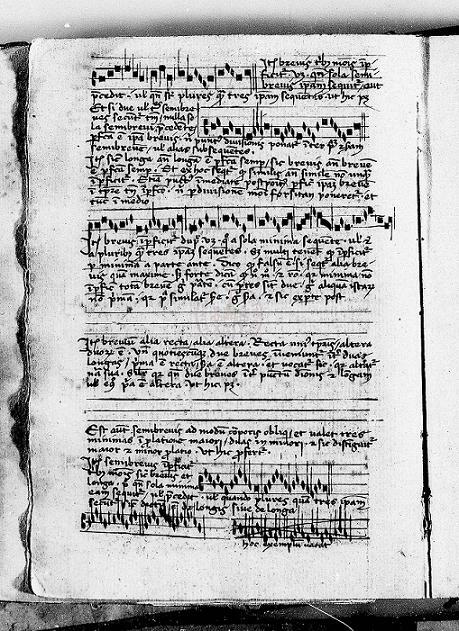 Medieval scribes often left examples out of their music treatises, signaling them with the words “ut hic” (“as here:”) but then allowing these “hic”s to remain as dangling indexes (see the blank staves in the image below). And we modern writers of texts about music sometimes skip them too, noting for ourselves that we need to return later or referring our reviewers or editors to a different file. “Place Example 5.7 here” can stand in for Example 5.7 until proofs. Then at the proof stage we are reminded of the million ways in which examples can be wrong (pitch, rhythm, text alignment, fonts, sizing…). Was it ever worth it? Seville, Biblioteca Capitular y Colombina, Sign. : 5-2-25, fol. 63v. I hope so. For all their being left out by scribes, skipped over by readers, or mangled by publishers, music examples do something unique and important. They allow us to point to a particular place in a musical work, to stop time so that we can observe in detail something which in its natural state goes by too quickly to be reckoned with (like cooling down particles to observe them, or being Quicksilver in X-Men). And for all that some readers will skip my examples, others, I know, will look only at them. A music theorist friend who is also a journal editor once told me that he always looks first through the examples in an article he reads, skipping the text and allowing them to tell their own story. Examples constitute an important, discipline-specific way of “showing our work.” Carefully selected examples can make the difference between a seemingly unsupported observation and a specific claim upon which others can be built. But they also leave us vulnerable to the reviewer’s caustic charge “I don’t see that in your example.” A music example, then, can seem like a gamble, but it is one worth taking. So how do we improve our odds? Can we guarantee that our examples will do us more good than harm, or that anyone will engage with them seriously? I always advise my students to write their analyses in such a way that a reader skipping the examples would still get the point. (“It’s your point to make, not the example’s—don’t count on your reader to do the work.”) But by the same token, and keeping my editor friend in mind, we can help our examples tell their story convincingly by using boxes, arrows, and careful captioning. We can excerpt just the right amount, giving enough context but not too much, so that the reader’s careful attention will be rewarded. Rather than seeing the variety of possible readerly approaches as a liability, we can think about the different learning styles of those with whom we are in dialogue—just as we would in the classroom—and do our best to make our argument multiply accessible. For me, one tool for keeping my examples organically embedded in my text is to avoid deferring their selection and insertion. A note to “find the right example and insert here” will lead to generic text that begs the question “do you need this example?” Instead, I stop writing, go to the edition or manuscript, actually do the act of selecting, scanning or editing, and then import the image back into my file. Yes, this can take hours or days, and in a climate where generating text is billed as the highest good, it can feel counter-productive. But it is not: appropriate examples produce text, just as text creates the opportunity for examples, and there is nothing so satisfying (to me, anyway) as writing paragraphs that accompany an example. They almost write themselves. By combining examples and text into the same file, the writer places herself into a similar reading situation to that of her reader, and can make the most intuitive decisions about what needs to be said before the example, and what after; which measures to mention in the prose and when to use a box or highlighting; when exactly to invite the reader to look below at example 5.7. You will not always have your way, of course—publishers may wish you to place an example later in the text than you intended. But at least knowing what you want will help you determine when to fight back and when to yield. And dissertation writers: this is the last time you will have full control over the placement and appearance of your examples. Revel in it, and use it to make the most convincing possible document. But it’s not all about the product: there is also the process. One of the results of making examples, of performing them or listening to them repeatedly, is that their content is rendered familiar—even intimately so. Now when I listen to a recording of the entire Hélas/Corde mesto (disk 2, track 12 on this album), the midpoint moment jumps out at me, winking like an old friend, arresting my attention, grounding me in the work’s larger narrative, telling me exactly where I am. This is a new phenomenon, and, considering that I have been thinking about this particular motet for about 12 years, it is noteworthy. We can write about whole pieces of music, edit them, typeset them, perform them, assign them, and translate them; but tiny, focused examples allow us to internalize them. That’s four more measures of the fourteenth century that I really know. Not a huge boon, sure, but considering the temporal, cultural, and geographical remove involved, it’s a start. And some of my examples are longer. When all is said and done, then, I suppose that I stand grudgingly behind my Example 5.7. At least it didn’t take us many takes to record. Anna Zayaruznaya is an assistant professor in the department of music at Yale University. Her first book, The Monstrous New Art: Divided Forms in the Late Medieval Motet, was published by Cambridge University Press in Summer 2015. One problem, of course, is that Microsoft Word hates images, especially when there are many of them and they are large. I avoid drafting in Word, and use InDesign and Scrivener instead. These programs are opposites in many respects: InDesign is expensive and focused on the page and its appearance (amazing for dissertations, if your institution will help you to a license—it’s part of Adobe Creative Cloud now) while Scrivener is cheap and wholly foregoes the concept of the page, allowing you to compose into a scroll. Both programs make inserting images easy and painless, and both are less likely to crash than Word. Both have something of a learning curve, but this is 2015, people. Learn your software. If you must use Word, take the time to make lower-resolution versions of your examples for the purpose of writing. Last month after delivering a pre-performance lecture on Dayton Opera’s recent production of Madame Butterfly I lingered in the hall for a good twenty minutes chatting with patrons about all sorts of things related to the opera and my talk. A couple, maybe in their 70s, wanted to voice their opinions on the destructive forces of American imperialism and I was happy to listen. Another older gentleman shared with me his uneasy memories standing in front of a replica of the bomb that flattened Madame Butterfly’s hometown of Nagasaki, and Bockscar, the actual plane that dropped it at the National Museum of the United States Air Force at Wright-Patterson Air Force Base, just five miles away from the opera house we stood in. For the past few years I have been delivering pre-performance lectures and schmoozing with patrons for the Dayton Opera, and I have thought of these engagements mostly as “public musicology”: an extension of my music history classroom, albeit for a slightly older audience. I have only recently thought about my teaching in the classroom as a form of public musicology, albeit for a slightly younger audience. Public humanities projects, like The National Endowment for the Humanities’ Common Good initiative, seek “to bring the humanities into the public square and foster innovative ways to make scholarship relevant to contemporary issues.” These projects are also usually broadly framed and interdisciplinary, bridging fields such as history, political science, and music as many fine contributions to this blog demonstrate. Shouldn’t music classes for undergraduate music majors and non-music majors alike strive toward similar goals? As I switch hats from the opera stage to the classroom I find myself asking the question: what differentiates public musicology from institutional instruction in musicology? Once we see these two spaces as connected (public and classroom) we can use public musicology as a pedagogical tool to help students think interdisciplinarily and to make connections between the study of music from the past and the performance of music in the present. It thus becomes an opportunity to create dialogue between and across disciplines, time, and individuals. Public musicology can be much more than sharing one’s research with the community, it can also be about sharing one’s teaching with the public as well. Musicologists such as Craig Wright, John Covach, Thomas Kelly, and Steve Swayne have opened up their classrooms to the world via the MOOC (Massive Open Online Courses). However, as the hype of the MOOC dies down and the media has all but stopped paying attention to what’s going on in these courses, perhaps we need to find some more low-tech and less costly ways to open up our musicology classrooms to the community. I’ll share some of my own efforts to meet these goals, not because I thought they always worked well (for the most part, they did), but I think we need to think more about the strategic public aims of our discipline and how they align with the goals of our courses. 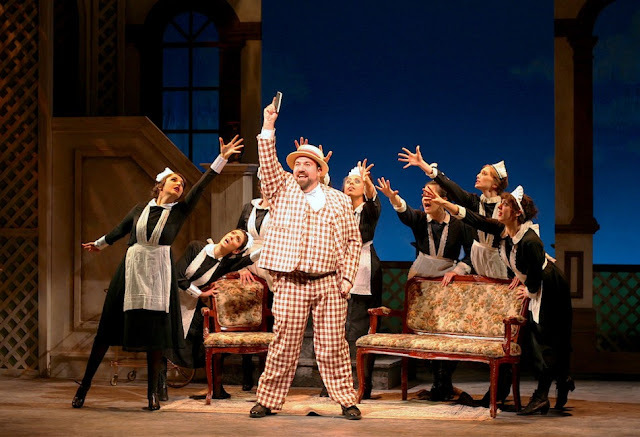 If we want to generate enthusiasm for our subject we can’t just look to the web and the season ticket holders of our local symphony/opera/ballet. We can and should also look within our own universities. Dr. Laura Sextro, my colleague in the History Department, and I worked under the supervision and guidance of Dr. Ellen Fleishmann, another historian who serves as the Endowed Alumni Chair of Humanities at our university, on a public humanities project tied to our teaching. We collaborated with other faculty across campus to commemorate the anniversary of The Great War through a series of curricular and co-curricular activities and used two of our courses as models for an interdisciplinary and collaborative public humanities project. My colleagues and I paired music majors in Music History II (Beethoven to Björk) with students from The History of Modern France. Music and history students engaged with the material analytically and experientially. Students stepped outside of the classroom to learn about the history and culture of this period by attending a series of co-curricular out-of-the-classroom events organized by the teaching team. After all, learning doesn’t just happen in the classroom. Public musicology is not just about the musicologist engaging with the public, but it is also about engaging students and the community together outside of the classroom. 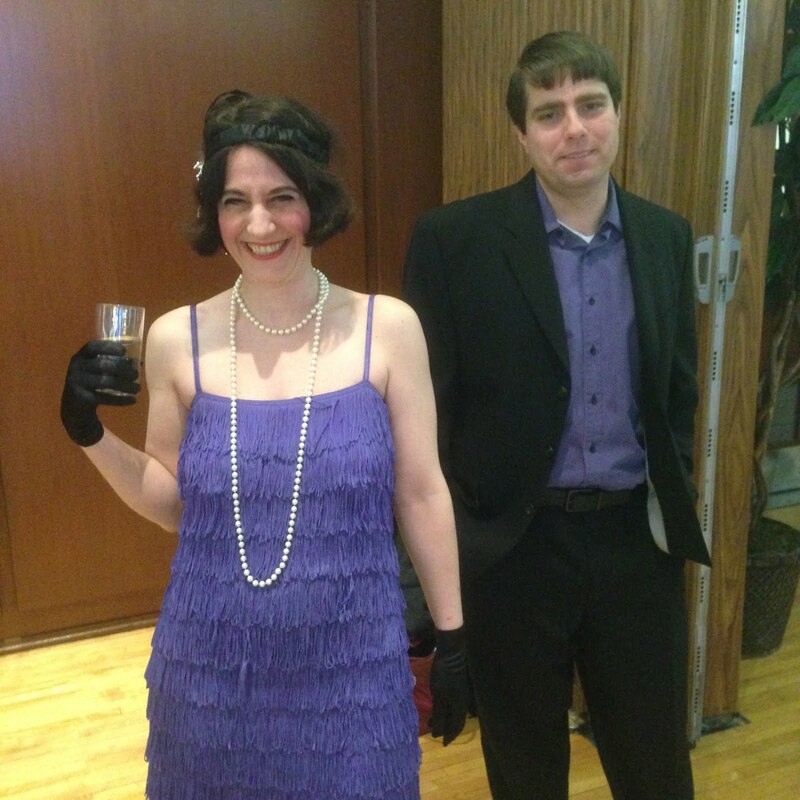 So, on a brisk February Friday evening, over a hundred students, faculty and community members gathered dressed in glittery flapper gowns to dance two-steps, rags, and Charlestons for a World War One-era Social Dance Party. Most of the people in attendance were not enrolled in either course. They were not forced to be there, they weren’t earning extra credit; they were just there to dance, maybe learn something new, and to have a good time. We provided snacks, vintage recordings, dance instruction and a roundtable discussion. What better way to get college students engaged then by having them dance with each other? But we didn’t just get them to dance; we got them to reflect on that dancing experience. Facilitated by historians and philosophers they were able to apply their experiences to the present state of social dance at an American University: to twerking, grinding and other booze-fueled house party gyrations. The idea was to get them engaged: engaged with the material, the historiographic problems, the lives of people involved, but also engaged with each other. One of the other goals was to form connections between the music majors and the historians. 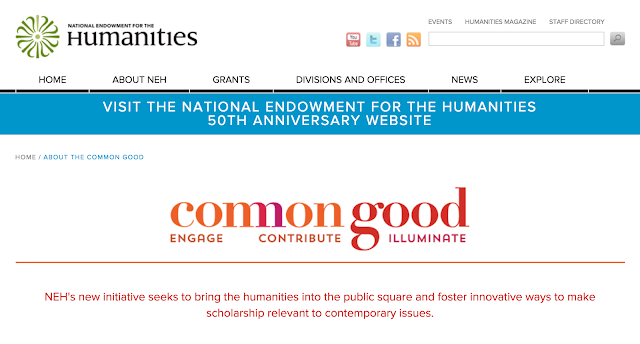 The “Public humanities” are, after all, all about forming connections across disciplines. This is not just about doing interdisciplinary research or interdisciplinary activities in the classroom – it’s about working with actual human beings from other fields: colleagues who will enrich our musicological practice and carry the knowledge we share into their own disciplines. 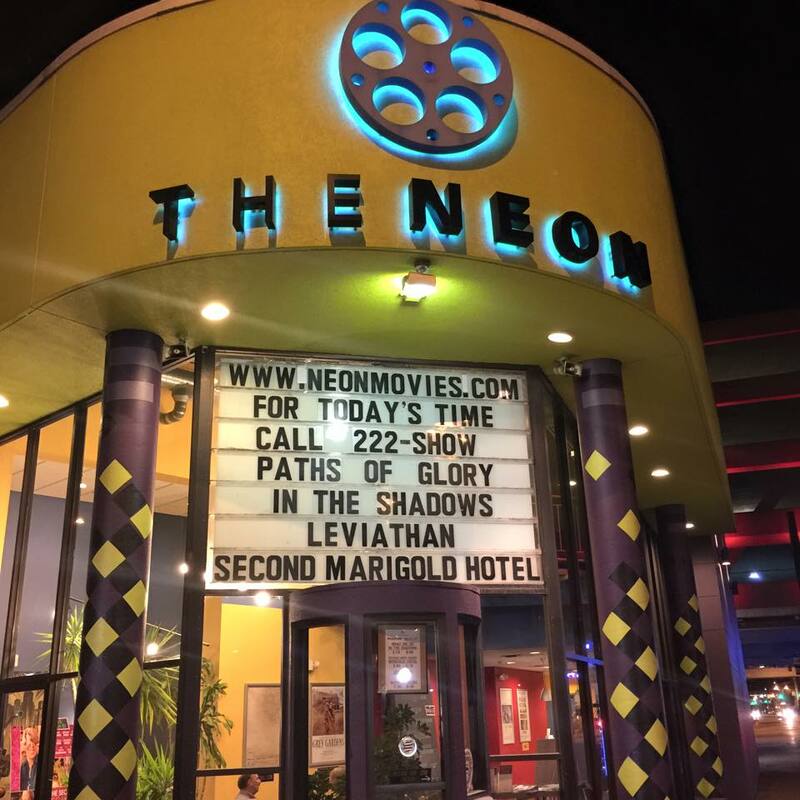 We took both classes to a performance of Benjamin Britten’s War Requiem [photos], and rented out the local art-house movie theater for a special screening of Paths of Glory (1957) free to the public and to our students. We also carefully interspersed our students with the seating arrangements. Music majors had to sit with historians, and they talked! Both the concert and the film provided models for the students for their future presentations in the ways evidence needed to be presented. The final project was a public lecture/recital where students of history and music worked in teams to present on music, history, culture, and war in WWI for the whole university community. Students spoke on topics including trauma in the trenches, emotion and memory after the war, nationalism, race on the battlefront, and the gendering of the homefront. The event included performances of Ives, Debussy, as well as popular songs of the period. In many of their final papers, students brought the music and culture of WWI into dialogue with current events through the comparison of nascent music therapy practices in the years after the Great War to current trends in treating PTSD in veterans of the Global War on Terror. 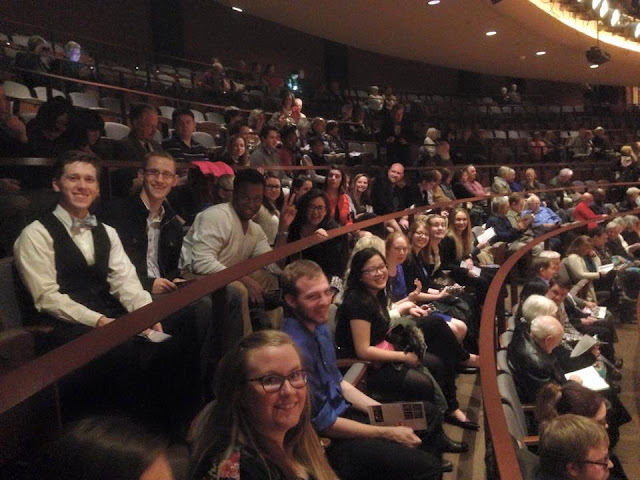 Music and History students at the Dayton Philharmonic performance of War Requiem, Schuster Center on March, 2015. Music students reported that they found these co-curricular activities exciting, engaging, and helpful in working with the history students and in completing their own independent research projects. A music student wrote, “Even though we may not have been involved in writing each others papers, their ideas about history helped inform our ideas about music.” A student in the history class reflected on the lecture-recital by saying of her new friends in music, “They were lovely to work with; they were so nice and willing to seek similarities between our topic and theirs. They chose a great song to perform that worked so well with the points we wanted to make about history.” A number of student papers in Music History also demonstrated a deep interdisciplinary engagement with historiography thanks to the collaboration with students in History of Modern France. At the end of the semester students in the History of Modern France course engaged in experiential learning (dancing, attending concerts and special film showings) that most history classes would not include. Significantly, students explored ways in which musical works and musical performances engage with historical questions. Historians realized that music can be an important artifact for analysis: as a primary source, but also as experiential. My music majors were introduced to the social theory side of history, the study of war, and political and diplomatic history. University of Dayton History Department faculty members dressed up for the WWI-era Social Dance Party on February, 2015. Most importantly, though, both classes developed academic and collegial friendships. They shared their bibliographies so that the lecture recital and individual final papers reflected an integrated familiarity with music history and history. The students were the ambassadors to each other and the public who attended their lecture-recital. They were the ones who ultimately made music/history more accessible, more engaging, and more relevant to contemporary issues. All of our students can do this. Just as a pre-performance lecture before Madame Butterfly can instigate a discussion on the proximity of war, trauma, memory, art and display, so can our students bring musicology together with other disciplines to perform public musicology for their own communities. Samuel Dorf is Assistant Professor of Musicology at the University of Dayton. 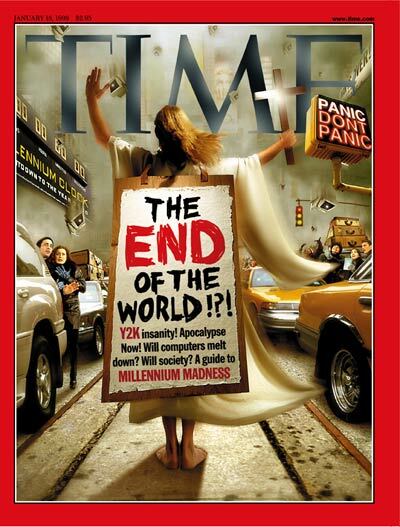 Y2K hysteria: Time Magazine on January 18, 1999. This is a good time, fifteen years into the new millennium, to look back at the phenomenon of millennial music. The dust from the mass hysteria widely associated with “Y2K,” and its horror scenarios of hospital machines failing and planes falling out of the sky, has largely settled. The turn of the millennium, the click of the digital clock from 12/31/99 at 23:59:59 to 01/01/00 at 00:00:00 has had a special psychological magic that the actual turn of the millennium, as pedants pointed out, a year later, simply did not possess. And as the calendars grow thin and we come to the end of the year that is simultaneously the beginning of a new one, it is an especially good time to think about that moment when time folds in on itself. The turn of the millennium gave rise to some unusual music, notably musical performances that last an exceptionally long time. 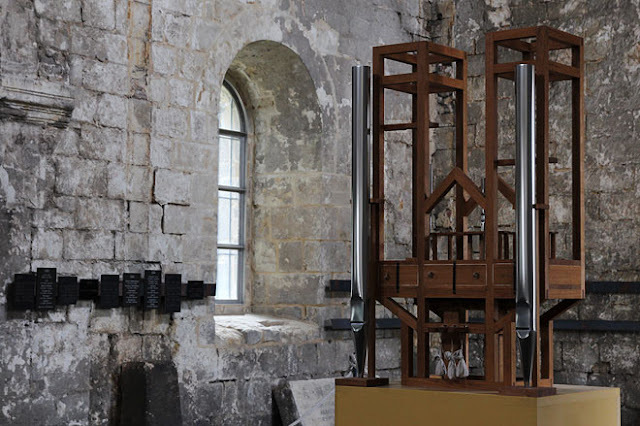 The John Cage Halberstadt Organ Project (2001) may be the best-known example of such millennial music, but it also happens to be the shortest of them: the performance of ORGAN2/ASLSP (1987) clocks in at a mere 639 years. The composition Longplayer (1999) by Jem Finer—perhaps better known as a founding member of the Celtic punk band The Pogues—is quite a bit longer. The composition for (synthesized) Tibetan sound bowls lasts exactly from Y2K to Y3K and then starts again from the top. But the longest by far is Rodney Graham’s Verwandlungsmusik (1991), based on a discarded snippet from Parsifal (deliciously, composed by Wagner’s amanuensis Engelbert Humperdinck) that is looped over a period of thirty-nine billion years. Graham has produced a CD, charmingly titled Orchestral Highlights from Parsifal (1882-39,969,364,735 AD). These pieces of music (for want of a better term) are less compositions in a traditional sense than sound installations that happen to be based on musical ideas but essentially ruminate on temporality. What can we do with these pieces? Our conventional battery of terms—musical works, listening, even melodies and rhythms—break down in the face of such vast expanses of time. What exactly does it mean to be listening to those pieces, whose length exceeds a normal lifespan? Can these pieces ever be more than a gimmick? I call these pieces “millennial music” for two reasons: not only were they started around the turn of the new millennium, but they also took part in the reflections on temporality that were the psychological domain of the transition from one unit of time into another. Longplayer was begun in London at midday on December 31, 1999, at the moment that the new millennium began at the International Date Line over the Pacific. The installation is based in a lighthouse in London very close to the meridian in Greenwich, which marks the longitudinal zero point of the globe and also determines the global time zones. (Despite his geographical and temporal precision, Finer chose the “felt” millennium over the chronological one.) From there, the piece can be heard at a small number of listening stations from San Francisco to Sydney. In addition, a live stream on the internet (recently supplemented by an app) keeps listeners elsewhere up to date with the continuous performance of the piece. 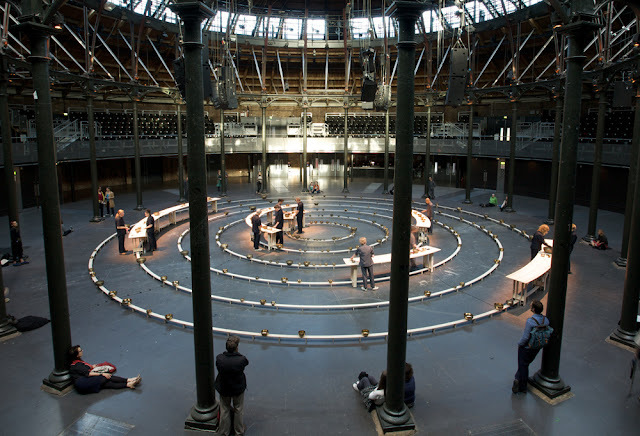 The John Cage Halberstadt Organ Project took up its mission in 2001, largely because its fund-raising efforts were too slow. As a consequence of this late start, the temporal calculations were off by a year and were not corrected until 2005. In a word, the performance began with a rhythmic error writ large. Verwandlungsmusik is a bit of an outlier: its starting point is projected back onto the opening night of Parsifal at Bayreuth, on July 26, 1882. This final of Wagner’s music dramas, after all, served as the stage consecration festival play for the new musical shrine. In the “Highlights” from this hypothetical performance of Verwandlungsmusik, Graham takes care to point out the precise points in time when we would hear the chosen excerpts, as each instrumental parts shifts phase at its own rate and comes together in kaleidoscopically changing constellations. Verwandlungsmusik is perhaps most readily understood as a thought piece. Its hypothetical nature is given material expression on the CD recording of its “Highlights.” Despite its projection into the most remote future, it very much exists in the here and now. The technology used here to make the music audible is already as good as extinct, and will probably not survive even into the next generation. If it continues to exist, then only as an algorithm outlining the combination of looping rates. The question of musical technology is a central concern in any of these millennial projects. Looking back onto the vast rate of technological change since Y1K, it is obvious that any technology that we consider cutting edge will be obsolete in only a few years or decades. (Homer Simpson’s quip: “Internet? Is that thing still around?” rings true in the face of these time spans.) Jem Finer knows that the computer technology his piece relies on will not survive even a fraction of the duration of the music, and has begun to think about alternatives. Everything points back to human performers as the most reliable and the most lasting medium. He has staged live performances of his piece, at a vastly sped-up rate, lasting a thousand minutes—or 16 hours and 40 minutes, still a considerable amount of time. What remains are merely the temporal ratios between events. The Halberstadt John Cage Organ Project has perhaps thought through the technological challenges most carefully: their performance takes place on a traditional instrument. The organ has a vast life span, and it can produce sounds that are in principle unlimited in length—provided enough energy, manual or electric, to sustain sound production. The duration of 639 years was determined precisely because it marked the life span of the previous organ in Halberstadt, which had been installed there in 1361. When I told my son about the Clock of the Long Now, he listened very carefully. “Will there really be people then, Dad?” he said. “Yes,” I told him without hesitation, “there will.” I don’t know if that’s true. But in having children—in engendering them, in loving them, in teaching them to love and care about the world—parents are betting, whether they know it or not, on the Clock of the Long Now. They are betting on their children, and their children after them, and theirs beyond them, all the way down the line from now to 12,006. If you don’t believe in the Future, unreservedly and dreamingly, if you aren’t willing to bet that somebody will be there to cry when the Clock finally, ten thousand years from now, runs down, then I don’t see how you can have children. If you have children, I don’t see how you can fail to do everything in your power to ensure that you win your bet, and that they, and their grandchildren, and their grandchildren’s grandchildren, will inherit a world whose perfection can never be accomplished by creatures whose imagination for perfecting it is limitless and free. And I don’t see how anybody can force me to pay up on my bet if I turn out, in the end, to be wrong. These vast timespans engender hope, optimism, and what is more, a call to take responsibility for the future. (It is hardly a coincidence that the “holiday from history”—the short window between the 1989 and 2001, between 11/9 and 9/11—also fell into that exceptionally optimistic period.) Responses to the musical millennial pieces are characterized by the same spirit of faith in the future. They are “future monuments,” to use Evander Price’s felicitous term. Several musical commentators have remarked, semi-seriously, on how they want to be around to hear the end of the piece. The Halberstadt John Cage Organ Piece is even described as a musical “apple tree” —referring to an aphorism usually ascribed to Martin Luther: If I knew the world were to end tomorrow, I would plant an apple tree today. The impossible length of these pieces, the associated sense of awe and profound amazement, opens the view to the vast field, the experience of sensory overload, that usually goes by the name of the sublime. Not only is it impossible to hear these pieces as a totality, but their whole point is that they cannot be listened to in total. The purpose of the vast timespan is to direct our attention to the most distant future, mindful of human finitude, and to contemplate the passing of time. There is a distinct ethical factor, which is also inherent in most reflections on the millennium, and which was hammered home by Al Gore and his much-derided but prophetic Powerpoint presentation, during that fateful millennial election year 2000: Will there be another millennium to celebrate?—Put drastically, those pieces of music invite reflections on matters of life and death. It seems easy to laugh off these millennial pieces as gimmicky. True, their extreme timespans lead us far out of our disciplinary comfort zone and leave us scratching our heads. Is this even music? (True also, the techno-fetishism, mixed with a good dose of new-agey inspiration, that characterizes much of The Clock of the Long Now can be a little hard to take.) But with a little more digging, the phenomenon of millennial music leads on to new questions of musical listening, of musical technology, of the nature of music, and of temporality. These are questions that we do well to pose—and, if there’s time, to try and answer. Alexander Rehding is Fanny Peabody Professor of Music at Harvard University and recipient of the 2014 Dent Medal from the Royal Musical Association.